View of A32x FlightDeck front panel. T.O. Position LSZH RWY 28 at dusk. Final LSZH RWY 28 at dusk. Rear View with C/B Panel. All C/Bs are connected an operational. Close view of front panel. Overhead Panel - all C/Bs are connected and operational. Overhead Panel - Annunciator Light Test. LSZH RWY 14 short final. WX CAVOK. LSZH RWY 14 short final. WX CAT 1. LSZH RWY 14 short final. WX CAT II. Visual Appch LSZS "Samedan" RWY 03. LSME "Emmen" ILS Appch Rwy 22. LSME "Emmen" ILS Appch Rwy 22 short final. LSGG "Geneva" ILS Appch Rwy 05. LSGG "Geneva" ILS Appch Rwy 23. LSGS "Sion" Visual Appch Rwy 25. LSZB "Bern" ILS Appch Rwy 14. The iBook will be opened in iBooks when clicked on from iPad or iPhone. A PDF version of this iBook is available here. Swiss based university "Zürcher Hochschule für Angewanndte Wissenschaften - Zentrum für Aviatik" is using FlightDeck A32x for class room instructions. 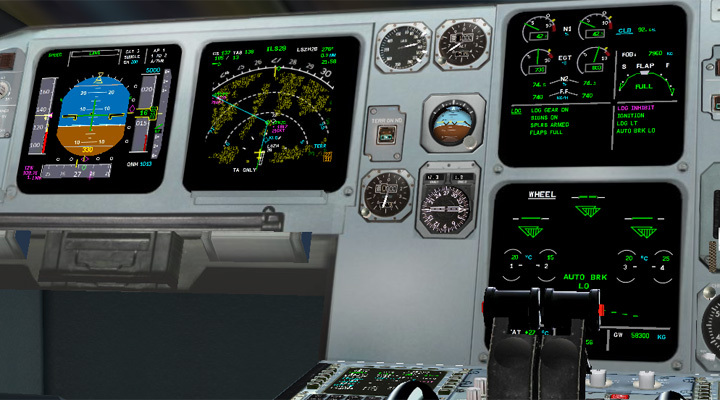 Korean airline Air Busan is using FlightDeck A32x for professional pilot training. Read more in this PDF here.